Why working at Legrand ? After over a century of company history, Legrand is more than ever looking to the future. This historic background is an asset for the Group, which has always demonstrated its ability to adapt to changes in the market. What started out as just a porcelain workshop gradually became a world leader in electrical and digital building infrastructures. Discover the history of Legrand through 6 topics. From a simple porcelain workshop to a world leader in electrical and digital building infrastructures. After over a century of company history, Legrand is more than ever looking to the future. This historic background is an asset for the Group, which has always demonstrated its ability to adapt to changes in the market. What started out as just a porcelain workshop gradually became a world leader in electrical and digital building infrastructures. 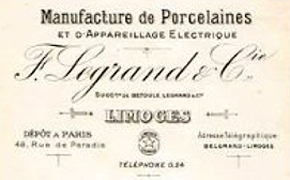 The company was founded in 1904, but in fact, Legrand is the successor of a company created in 1865. 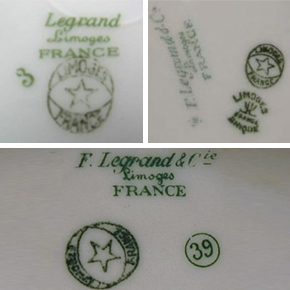 The origins of Legrand go back to 1865, when a porcelain tableware workshop was set up wood merchants Henri Barjaud de Lafond and Léonard Clidasson along Route de Lyon (now called Avenue du Maréchal de Lattre de Tassigny) in Limoges, where the Group's head office is still located today. The factory was built on the banks of the Vienne river so that wood could easily be brought to fuel the kilns in which the porcelain was fired. It was operated in turn by Ernest Duchatelet (1865), Mr. Léobon (1871), Paul Lacroix (1876) and Henri Barjaud de Lafond (1877). In 1897, brothers Jules and François Vultury bought the factory and operated it themselves. In 1904, the business was bought by Frédéric Legrand, Charles Alary and Jean Joquel, to become the Legrand, Alary & Joquel Company. From then on, Legrand was part of the company name. In 1911, the company name changed to Betoule Legrand & Co. 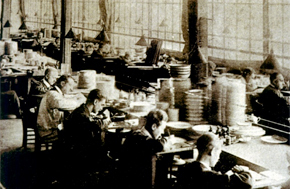 In 1919, one of the partners, Jean Mondot, a Limoges craftsman who had set up a small factory at nearby Exideuil producing light switches made from porcelain and boxwood, expanded the company’s business by creating an ‘electrical wiring devices’ branch. Over the years, low-voltage electrical wiring devices were to gradually become the company’s main activity. 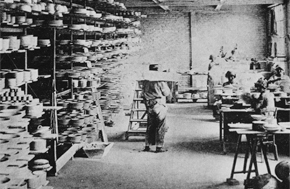 As a means of optimising kiln capacity, small insulating components for electrical wiring devices were cured and dried in the otherwise unused space between stacks of round plates. Over time, the part design and curing processes became increasingly professional and ovens dedicated to producing insulation components for electrical devices were set up. 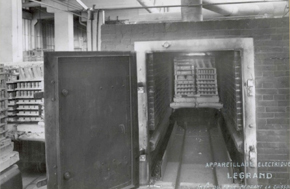 The factory acquired the first tunnel kiln in Limoges, operating on town gas, and intended for the firing of porcelain for electrical engineering applications. It was later demolished, in 1980, when porcelain manufacture was permanently halted in Limoges. Legrand was taken over by two industrialists from Northern France who were also brothers-in-law, Jean Verspieren and Edouard Decoster. Porcelain was still the main material used in the assembly of devices. The use of plastic was gradually increasing, first with thermoset plastics, then with petroleum-based thermoplastics from 1959 onwards. 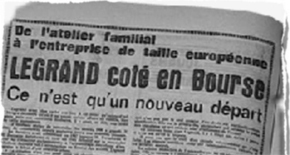 In 1966, Legrand acquired its first subsidiary outside France, in Belgium. This date marks the beginning of its policy of self-financed, carrefully targeted acquisitions. Find out more about Legrand's acquisition policy. Discover Legrand in 1969, in an 8-minute feature broadcast in June 1969 on the regional news channel. View the photo series to see the various Legrand workshops in the years between 1950 and 1970. On August 25 th , 1949, a fire destroyed almost all of the workshops where porcelain tableware was manufactured, putting a stop to that line of business. The electrical wiring devices branch was also badly damaged, but the two directors, Jean Verspieren and Edouard Decoster, decided henceforth to specialise in the production of electrical wiring devices only. Legrand headquarters in 1948, before the fire. 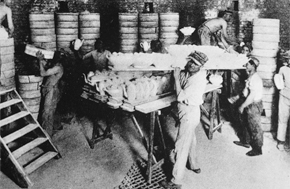 Production of porcelain tableware adjoined that of electrical wiring devices. Legrand headquarters after the fire in August 1949. Buildings were severely damaged. 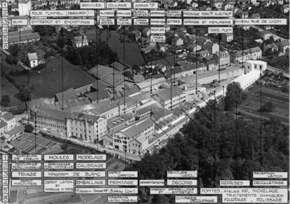 Factory reconstruction in 1949. The facilities were fully functional again within a year. In 1970, on the strength of its economic performance, Legrand was listed on the Paris Stock Exchange. In January 2001, Schneider Electric launched a friendly securities exchange takeover bid aimed at controlling all of Legrand’s capital. But the European Commission eventually opposed the merger on competition grounds. The ensuing ‘demerger’ process was completed in December 2002. After an agreement with Schneider Electric was reached, 98% of the Legrand Group's capital was acquired by a Consortium consisting mainly of Wendel Investissement and KKR. Following the above operation, Legrand shares are withdrawn from the Paris stock exchange in October 2003. 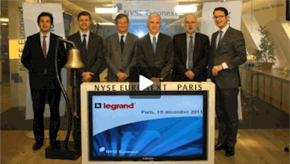 Legrand returns to the stock market, listed on Euronext. In 2011, Legrand becomes part of the CAC 40. Legrand's growth model is based on innovation, regular launches of value-added products, and targeted, self-financed acquisitions of small to medium size companies that enjoy leading positions on their markets and are complementary with the Group's business. Since its first flotation on the Paris stock exchange in 1970, Legrand has maintained close ties with its shareholders, who support its development by providing the capital needed to finance its expansion. 2001: Schneider Electric launches a friendly securities exchange takeover bid aimed at controlling all of Legrand’s capital. But the European Commission eventually opposes the merger on competition grounds. As the share exchange process has taken place, Schneider is forced to divest itself of the entire share capital of Legrand. 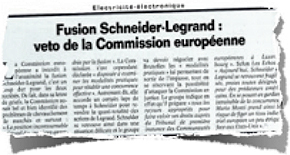 2002 / 2003: Completion of the ‘demerger’ process: after an agreement with Schneider Electric is reached, the capital of the Legrand Group is acquired by a Consortium consisting mainly of investment funds Wendel Investissement and KKR, and Legrand is delisted. 2006: Legrand returns to the stock market and is listed on Euronext Paris in April. Kohlberg Kravis Roberts (KKR) and Wendel Investissement remain majority shareholders with a 30% share each, with 19% free float, 16% held by minority shareholders and 5% by management and staff. At the end of 2006 minority shareholders (banks and funds) sell their shares via an accelerated private institutional placement, thereby taking traded shares to 35% of the capital and increasing stock liquidity. KKR and Wendel Investissement strongly reduce their shareholdings in Legrand, which are brought down to 6% each. In December 2011,the combined effect of its share price trend, an increase in free float and the rising volume of traded shares leads to Legrand's inclusion in the CAC 40 index. "Legrand’s return to the CAC 40 is good news, not only for the 32,000 Legrand employees, who are proud of this accomplishment, but also for the company, whose profile will be raised, and of course for the shareholders." Gilles Schnepp, Chairman and CEO, rings the ceremonial bell that signals the opening of trading at the stock exchange. The first pushbutton switches appeared between 1920 and 1930. Pushbuttons contain a stem, whose conducting end touches the fixed tabs when you press the pushbutton at the other end. A spring in the axis of the stem returns the stem and pushbutton as soon as you release the button: this is what is called a non-maintained contact. A rotary switch operates by the rotation of conducting tabs around an axis perpendicular to the fitting plane, which enter into contact with fixed terminals or tabs. The control button is called the key. Rotary switches continued their development until 1950, and were then gradually phased out as new toggle switch ranges replaced them (the last waterproof model dates from 1969). This disappearance is mainly due to the complexity of the mechanism and the difficulty of operating the key. Tumbler switches operate by the rotation of a stem or rocker around an axis parallel to the fitting plane, with the end being squeezed to come into contact with fixed terminals or tabs. The control button at the other end (on the outside) is called the key. Like rotary switches, these developed until 1950, and then gradually disappeared as new toggle switch ranges began to replace them. In 1953, the built-in fuse range appeared, incorporating a feature that had previously been external. This enhanced the safety of installations, while also improving repair and maintenance. The new range (Antibes and Amboise series) also used this option, which was to disappear (because of changes in standards) around 1984. With only a few exceptions, up to 1955 all switches had washable contact surfaces. The appearance and development of these new ranges is related to the use of silver contacts (already used in electrical contactors), and thanks to the self-cleaning nature of these contacts, this movement could be replaced by a normal direction movement. Because the silver contact was also better than the earlier ones, the contact pressure could be reduced, allowing new simpler, more lightweight, more compact mechanisms to be developed. The control button changed its name and became known as a ’rocker’. Unlike the old tumbler switch, these new ranges would be in constant evolution in terms of shape, colour, functionality (adaptation to living circumstances and use, flush-mounting, ease of installation, etc.). This gradually increased their complexity. Moreover, it is noteworthy that each new range created would incorporate the options from previous ranges in addition to its own new options. From a basic switch to a touch screen via a soft-touch control, it is now possible to choose how to control lighting. This logo was used between 1870 and 1949 on porcelain tableware. It shows a star encompassed by two half-moons, bearing the inscriptions 'Limoges' and 'France'. On the back of plates, this logo was often combined with the name 'F. Legrand & Cie Limoges France'. Made up of the letters CLL, for 'Compagnie Legrand Limoges', this logo was used from 1925 until 1967. During this period, it was to be found on packaging, catalogues and the façade of the head office building. 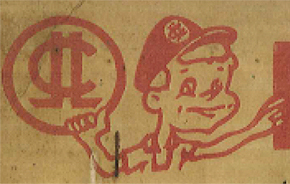 From 1955 on, the "CLL" logo is used in combination with a cartoon of an electrical installer in action, whose cap bears the logo. This figure ceased to be used in 1968. Before the creation of the version we are currently familiar with, the logo was redesigned through reassembly of the two capital 'L's in the "CLL" logo, placed facing each other head-to-foot in combination with two lines to represent a switch with its incoming and outgoing wires. The name "legrand" was placed in small lettering to the right of this visual. This logo was used for 6 years between 1968 and 1973. This logo in black was also frequently combined with the name "legrand" written in larger-scale lettering, and in several colours. Still in use today, this logo was first used in 1974 in certain applications. It comprises the two black 'L's facing each other head-to-foot in combination with two lines to represent a switch with its incoming and outgoing wires, as well as a red "legrand" of the same size as the square that suggests a switch. Extended to all-purpose use as of 1976, this logo is a registered trademark to protect against counterfeit and copy. The experience and commitment of Legrand's senior and middle management have enabled it to nurture and maintain a unique corporate culture that inspires and rewards talent and initiative. In 1865, Henri Barjaud de Lafond and Léonard Clidasson, wood merchants, built the porcelain factory, which was operated in turn by Ernest Duchatelet (1865), M. Léobon (1871), Paul Lacroix (1876) and Henri Barjaud de Lafond (1877). 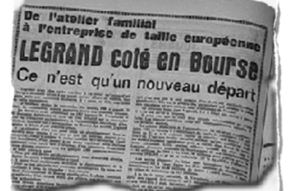 In 1904, the business was taken over by Frédéric Legrand, Charles Alary and Jean Joquel. 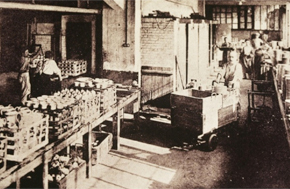 In 1911, the company was run by Emile Betoule and Frédéric Legrand. After a period of joint management with Emile Bétoule, in 1924, the company was managed solely by Frédéric Legrand and took on the name Legrand & Co. 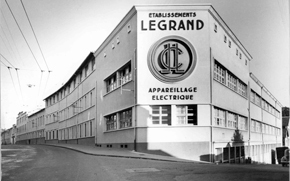 In 1944, Jean Verspieren and Edouard Decoster took over the management of Legrand. After Jean Verspieren's death in 1983, Edouard Decoster continued running the company until 1988. In 1988, Edouard Decoster handed the chairmanship of Legrand over to François Grappotte, a graduate of the Ecole Nationale d'Administration (ENA), who was to be Chairman and CEO until 2006. Gilles Schnepp became the Group's Chairman and CEO in 2006. A graduate of HEC in 1981, Gilles Schnepp joined Legrand in 1989. Having been Deputy CFO and then CFO, he became Vice Chairman and COO in 2004. In 2006, he succeeded François Grappotte as Chairman and CEO.